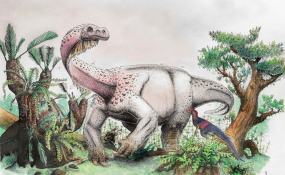 The dinosaur Ledumahadi mafube - reconstructed in this illustration - made headlines in 2018. For 23 years the intricacies of a 4-million-year-old cranium fossil discovered in the Jacovec Cavern in the Sterkfontein Caves remained a mystery to researchers. But thanks to high-resolution imaging technology, researchers at Wits University have discovered that the skull belonging to the extinct genus Australopithecus is remarkably similar to the human skull. "Our study revealed that the cranium of the Jacovec specimen and of the Australopithecus specimens from Sterkfontein, in general, was thick and essentially composed of spongy bone," researcher Dr Amelie Beaudet said. "This large portion of spongy bone, also found in our own cranium, may indicate that blood flow in the brain of Australopithecus may have been comparable to ours, and/or that the braincase had an important role in the protection of the evolving brain." This means that the thick protection provided by the skull may have allowed for the human brain to evolve into what it is now. The high-resolution scanning techniques in "virtual palaeontology" have created an opportunity for researchers to learn more about human ancestry and evolution. The findings uncovered by researchers from the School of Geography, Archaeology and Environmental Studies of the University of the Witwatersrand and a team at Sterkfontein have since been published in the Journal of Human Evolution. It has also brought more attention to the national treasure that is the Sterkfontein Caves, which was home to the world's first adult Australopithecus, "Mrs Ples", and Little Foot. "The Jacovec cranium exemplifies the relevance of the Sterkfontein fossil specimens for our understanding of human evolution," Beaudet said. "Imaging techniques open unique perspectives for revisiting the South African fossil assemblage."